She stands beneath the web, seemingly oblivious to its occupant whose legs could reach around her small waist twice should it choose to move closer. In front of her, a man in a white coat with a stethoscope draped around his neck is playing with a syringe the diameter of a toilet roll. The girl stands perfectly still, unafraid and unflinching. My latter day Alice in Wonderland is standing in La Plaza de La Luz in Los Silos and this is the last day of the Festival Internacional del Cuento – the festival of storytelling. All around the small plaza are figures from fairytales; goblins and princesses lurking beneath the trees; giant spiders hanging from webs strung between branches; strange creatures picking their noses. Children fill every space; waiting in line to see the comedy doctor; sitting cross-legged on the ground in front of a small group with acoustic guitars who are leading them in a medley of hand-clapping, chorus-singing favourites. There are trestle tables laden with story books and colouring books for sale. In the flower beds, children’s paintings are drying in the last of the afternoon’s sunshine. Outside a Wendy Hose, a storyteller is calling children inside to sit on tiny stools and listen to a tale from a far away land. Since 1996 the little town of Los Silos has hosted the magical festival of storytelling to promote reading and stories. Begun by Professor of Literature and Drama, Doctor Ernesto Abad, storytellers from around the world travel to this small town on the north coast of Tenerife to tell their stories: African Voices, Nordic Tales, Through the Eyes of Women and Nights of Terror are all regular contributors. Over a week or so in early December, stories come to life beneath the trees in La Plaza de La Luz and the magic of words reaches into young minds and teaches them to travel to distant and fantastic lands where anything is possible. y parece que las cortezes se abren y empieza el milagro. Las historias viajan desde lejos por la sabía. Los árboles encierran sabiduría Antigua. And it seems like the bark itself opens and the miracle begins. The stories have travelled a long way to be heard. The trees contain ancient wisdom. This week I went to the hamlet of Masca, a place I’ve visited often, in the south west of Tenerife. It’s the second most visited place on the island after the Teide National Park and its attraction lies in its location and its beauty. 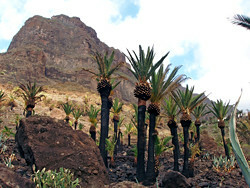 Sited at the top of an 8 km gorge hewn from the ancient Teno Mountains, the village consists of three small settlements of rural houses and fincas scattered around a valley dense with palm groves, fruit trees, sugar cane and giant agave plants. Only accessible since the 1970s when the road was built, it’s commonly referred to as Tenerife’s Shangri-La. When I took the steep path down from the upper to the lower valley, I was shocked by what I saw. Where once a valley luxuriant in palm trees stood, now only a handful of black trunks spawned a green crown; where once the valley floor was invisible, now it stood naked in soil and stone; where once the giant agave stood as high as a man, now its serrated limbs lay in charred and twisted heaps. What I was seeing was the dismembered remains of the summer’s holocaust of forest fires that had swept through the valley like an air-borne virus. But from the ashes of the fire a new beauty was emerging. The palm trees that had remained standing now had black trunks which stood out against the valley’s backdrop. Topped by the vivid green of fresh, new growth, the palms had taken on a surreal beauty that threatened to surpass their original design. In Bar Blanky I chatted to a couple who’d come to Masca on a half day trip from one of the resorts of the south coast and it seems their tour guide had seen fit not to mention the summer’s fires. As far as this couple were concerned, this was Masca, for them it had never existed any other way. And for me, had I not come back to see it now, Masca would still exist in exactly the same way it always had done, a spectre of my imagination, a true Shangri-La.